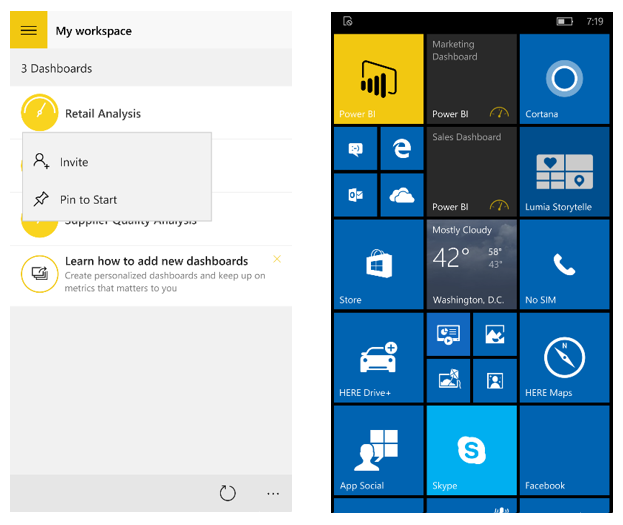 We are excited to introduce the Power BI app for Windows 10 Mobile. This new app is another step towards Power BI‘s goal to bring your data anywhere, anytime, everywhere. Similar to the Power BI apps for iOS and Android, the Windows 10 app is built from the ground up to be optimized for touch and mobile productivity. It enables you to explore dashboards and reports, invite colleagues to view data, and share insights over email to engage your team. All of the great visuals supported in Power BI have been designed to match the new Windows 10 experience. It can be tricky to find a balance between having as much data as possible and accessing specific data points quickly. With the new Pin to start feature, you can add a direct link to a dashboard right to your phone home screen. When you want to access that data again, just click on the pinned tile and the Power BI app will open with the specific dashboard. 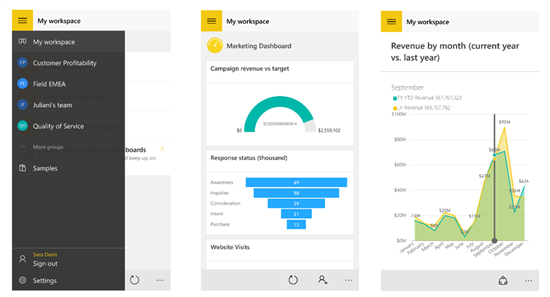 Whether you’ve scheduled your data to refresh once a day or once a minute (using Power BI Rest API), the Power BI app for Windows 10 Mobile will always ensure that you have the most recent data in the palm of your hand. No manual refresh required! The Power BI app for Windows 10 Mobile takes advantage of the Windows environment and works in ways that you’re already used to. For example, press and hold in your dashboard index to open the context menu. This is just the first step towards a fully advanced experience on Windows mobile phones, and the journey will continue with popular features such as Landscape mode. Tablet and PC users can expect to see the new Windows 10 navigation and user experience in their apps soon.